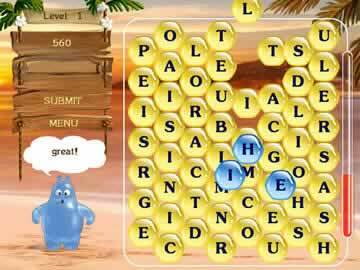 Aqua Words Game Review - Download and Play Free Version! Fun word game with a really cute character! Educational word game that helps build your vocabulary. 3 game modes keep the game interesting. 3 levels of difficulty make it so spellers of all skill levels can play. Level to level the objectives do not change. Welcome to the world of addicting word puzzle games! In Aqua words, you will get random letters in bubbles and you will then link those letters together to form a myriad of words. The bigger and harder the word, the more points you get for its' creation! When a word is created, those bubbles fall away and new ones replace them. This means you will need to be careful how you choose to use your letters or you might get stuck! Aqua Words has 3 different modes of play: arcade, time attack, and a strategy mode. 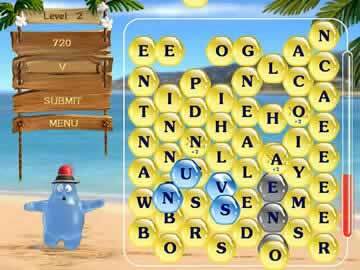 In Arcade mode, you will start with the lower portion of your screen filled with letters and have to keep the letters from reaching the top. Kind of like Tetris, except with words. Time Attack mode consists of starting with points and watching those points go away if you aren't able to create new words fast enough to replace the declining points. Strategy mode consists of starting with given letters and trying to rack up as many points as possible without any sort of time limit. If you are worried your vocabulary is too large or small, don't worry... there are three different difficulty settings. Also, you can add words to an already vast database. If you need a game that gives your brain an active challenge, give Aqua words a try. Aqua Words is a word game packed full of features that consists of connecting adjacent letters to form words. The longer the words are the higher the score you receive, thus getting you closer to the next level. This game is one of the best on the market and playing improves both your vocabulary and quick thinking abilities. Aqua Words is a word game that has you connecting letters with adjacent letters to form words. The game space is 8 columns long and 7 or 8 rows high. This provides you with 60 letters. Each letter is in a water bubble and is surrounded by 6 other letters. To form words you click on the first letter and then the next in the series until the word is formed. It's a simple concept for a game, but it really causes you to think and scan your brain for the right combinations. Apart from its smooth style of gameplay, the differing modes and difficulties set Aqua Words apart from other games on the market. This game has three modes of play: arcade mode, time attack mode, and strategy mode. The premises of these three modes is similar, yet the objectives vary. In arcade mode you start with a half-filled (half-empty if you're a pessimist) game space and you must create words out of the letters, while letters are being added to the space. This mode is similar to Tetris, but rather than making lines, you are making words that disappear to open more space, once you've spelled them. Each word you create is worth a point value and once you earn enough points you advance to the next level. The difficulty increases level to level. The second mode is the time attack mode. In this you start with a full game space and as you spell letters are replaced. You race against the clock in this mode. Each word you spell earns you points that increases your score, but taking too long makes you lose points. You must spell words quickly in this mode to advance to the next level. The third mode is a much more relaxed style of play. Strategy mode is the perfect mode for casual players or beginning spellers. In this mode you have unlimited time to figure out words and advance to the next level. The game space is similar to time attack in that you have a full board and the words you spell are replaced with new letters. This is the relaxing mode that allows you to focus on the bigger more valuable words. As far as drawbacks are concerned this game has a few minor flaws. The most crucial is the monotony you might feel when playing. The concepts of the game are straightforward and don't change level to level. These identical levels could make the game get old pretty fast since you are playing essentially the same thing. If there were mini-games or other small tasks incorporated into the normal gameplay, it might make for a better and less monotonous game. The second much smaller flaw is with the scoring. The scoring is unclear. It is obvious that bigger words score more points, but knowing exactly how things are scored is tough to figure out and unclear. If this aspect were improved it would make the game more fun because you would know exactly what you were doing. Overall, Aqua Words deserves its high game score and needs to be played. 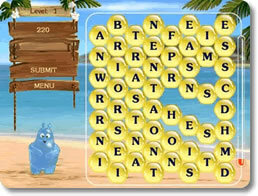 If you are a fan of word games or if you want to improve your vocabulary in fun manner, this is the game for you. The three game modes and varying difficulties make this game for anyone who can spell regardless of skill level.